By Paul Trewhela, Political prisoner, Pretoria and Johannesburg, 1964-67. Co- editor of banned South African exile magazine, Searchlight South Africa, 1989-1994. The Communist Party of China – the ruling party for over 60 years of the totalitarian dictatorship of China, which owns and controls the state in the second biggest economic power in the world – has taken 20 percent control of the second biggest press corporation in South Africa. This is the most dangerous attack on press freedom in South Africa in more than one hundred years since the founding of the Union of South Africa in 1910, and a breach of the spirit of the 1996 Constitution of the Republic of South Africa. As part of this deal, which poses a new colonialist threat to South Africans, the ruling Zuma faction in the ANC which controls the government, has in turn taken 25 percent control of the same newspaper company, through its control of South African taxpayers’ money, in collusion with the power-brokers of the Chinese Communist Party. This is the only reasonable interpretation to follow from an article “Why China is making a big play to control Africa’s media” by Geoffrey York, reporting from Nairobi in the Globe and Mail (Toronto, Canada) on 12 September last year, which provided these statistics. The press corporation controlled by these two repressive governments – the Chinese government responsible for the colonial occupation of Tibet, and the Zuma government responsible for the Marikana massacre of impoverished mineworkers in August 2012 – is the former Argus Company, previously owned by the Oppenheimer empire through the Anglo American Corporation, which was sold to the Independent News and Media Group, led by Tony O’Reilly, in 1994. Independent News and Media sold its crucial South African cash-cow to its new owners, the Black Economic Empowerment company, Sekunjalo, last August. Wikipedia reports that the Independent News and Media controlled 14 newspapers in South Africa, including The Star and Pretoria News in Gauteng; the Cape Times, Cape Argus, Daily Voice and Weekend Argus in Cape Town; The Mercury, Post, Isolezwe, Daily News, Sunday Tribune and Independent on Saturday in Durban; as well as the Diamond Fields Advertiser in Kimberley, the nationally circulated Sunday Independent, and 13 community newspapers in Cape Town. The group’s titles were reported to account for 28 percent of the total advertising spend in paid newspapers in South Africa, 22 percent of all newspapers sold in the country, and 63 percent of the English language market. This effectively made it the most powerful group in the most widely-read language medium of print journalism in South Africa. The front man for this deal is the chairman of Sekunjalo, Dr Iqbal Survé, the former doctor of Nelson Mandela. Dr Survéis chairman of the South Africa-Saudi Arabia Business Council and a Council Member of the South Africa-US Business Forum. Sekunjalo now owns 55 percent of the former Oppenheimer/O’Reilly press network in South Africa. Between Iqbal Survé, the Zuma government and the Chinese Communist Party, it is clear who now holds the whip hand in print journalism in South Africa. Its purpose is state political control of news and analysis. In addition to Iqbal Survé, the directors of Sekunjalo are listed as: Khalid Abdulla (chief executive officer), Salim Young (lead independent non-executive director), Vukile Mehana (independent non-executive director) and Aziza Begum Amod (non-executive director). Leading employees include: Wallace Mgoqi (chair), Diane Case (non-executive director) and Linda Nyembe (chair). Related people are listed as: Mohamed Yusaf Kajee (executive director for Sekunjalo Investmants) and Ferhad Khan. No foreign state – and no Communist state – has acted so arrogantly in South Africa since the British government withdrew from political control of South Africa in 1910, after it had defeated the Boer governments of the Transvaal and Orange Free State in the war of 1899-1902: the three-year war for control of South Africa’s gold mines. Wasting little time, Sekunjalo has already begun to act as dictator by sacking the exemplary editor of the Cape Times, Ms Alide Dasnois, immediately after the death of Nelson Mandela last month, following an article in the Cape Times alleging corruption in Sekunjalo. This week it terminated the contract of the former political prisoner and independent labour journalist, Terry Bell, following an article last month in Bell’s syndicated Inside Labour column which criticized the drive by Sekunjalo to muzzle freedom of the press. Founded in 1889 when Francis Dormer established the Argus Printing Company, it was renamed Argus Newspapers Ltd after it was taken over by the Anglo American Corporation, headed by Harry Oppenheimer, which by 1981 held a 40 percent holding. Anglo American ended its ties with Argus Newspapers in 1994 when it sold 31 percent of its stake to Tony O’Reilly, the owner of Independent Newspapers and Media of Ireland, including The Independent daily newspaper and the Independent on Sunday in Britain. Writing in the Toronto Globe and Mail, Geoffrey York wrote: “If there is an ‘information war’ between China and the United States on an African battleground, as former U.S. Secretary of State Hilary Clinton suggested at a Congressional committee hearing in 2011, it appears that China is beginning to win the war. “In South Africa, Chinese investors have teamed up with the ruling African National Congress to purchase Independent News and Media, one of the most powerful media groups in the country, which owns daily newspapers in all of the major cities. “The deal was spearheaded by Iqbal Survé, a businessman with close African National Congress connections who says he wants the media to report more ‘positive aspects’ of the country. Financing was provided by state groups from China and South Africa, along with Mr. Survé’s consortium. Top leaders of the ANC helped put together the Chinese investors with Mr. Survé’s group, analysts said. “Under the deal, China International Television and the China-Africa Development Fund, both controlled by Beijing, will end up with 20 per cent of the newspaper chain – a stake that will allow them to materially influence the company, according to South Africa’s Competition Commission. There lies the drive for media dictatorship in South Africa. On the last day of 2013, less than two weeks before he died peacefully at his home in London at age 91, Stanley Uys sent me an email with a comment of the fate of the former Argus Company in South Africa, the biggest owner of print journalism in the country for many decades. It is a farewell salute by the doyen of South African journalists to a brave response by Terry Bell, a veteran South African journalist, to the repressive drive by Sekunjalo against a free press in South Africa, and to the asset-stripping drive by the Independent group before that, under Tony O’Reilly. “Excellent material,” wrote Stan. “I wonder whether an article can be compiled for publication in the UK? I tried once or two twice in the past, but the papers gathered protectively around the Independent!! But there must be some (not left-wing) that would take a full article on what damage O’Reilly really did to the media in SA? The Inside Labour column in Business Report may be no more. In a unilateral decision, the column and the annual cycle of this contribution, scheduled to start this Friday in the Pretoria News, Johannesburg Star, KZN Mercury and Cape Times has been put on indefinite hold while a “recalibration process” by the new management is underway. Although I was commissioned (in the same way it has been done for 18 years) to submit the first of the year’s columns for this Friday I have been informed by the editor that “the Inside Labor column is on hold until further notice. So I do not expect any column from you until I advise you otherwise”. I have informed the editor and, via him, the putative new owner, that I consider the actions taken to constitute an abrogation of my long-term contract and that this probably amounts to a situation of unfair dismissal. Watch this space. I am posting below, again, Terry Bell’s Inside Labour column, “Clarity, Kriel and the Cape Times”, of 28 December 2013. His funeral will be in London this coming Saturday, 25 January 2014. Salute to Stanley Uys, a great defender of media freedom against tyrants of all kinds, old and new. A lack of adequate resources and asset-stripping by the Irish carpetbagger Tony — now Sir Anthony — O’Reilly are the real problems with the Cape Times, not the undeniable quality, let alone pigmentation, of the staff. But there are other issues too that require examination. What interest or standing does Andre Kriel, general secretary of the clothing and textile workers’ union (Sactwu) have in the ongoing dispute involving the Cape Times and Independent News Media (INM)? This question has become pertinent since Kriel, as early as December 14, demanded that all correspondence regarding the dispute “should be via me”. According to Kriel, he had spoken to the putative owner of INM, Iqbal Surve, and that Surve had agreed that he, Kriel, should “facilitate this matter”. Kriel has also launched attacks on the Cape Times, claiming that this newspaper “has not ever carried one positive story about the great struggles that workers have waged”. He clearly sees his role as one campaigning against “neo-liberalism”, something he apparently sees as epitomised by the Cape Times. However, Iqbal Surve, the executive he admits to serving, has stated that one of the problems with the Cape Times under its now effectively sacked editor, Alide Dasnois, was that the newspaper was “not business-friendly enough”. In fact, one of the proposals of the new management is to remove trade union and other labour/worker news to separate publications, presumably financed, at least in part, by the labour movement. This would be a journalistic travesty since newspapers should attempt to reflect all of society and not be forced to cater for ghetto interests. The simple fact is that any newspaper worthy of the name attempts to provide a reasonable reflection of the society in which it functions. It also provides a forum where different points of view may be aired on opinion and letters pages. In this regard, the Cape Times has, certainly in recent years, been as good as any and perhaps better than most, despite a paucity of resources. Kriel’s caricature of the newspaper therefore reveals that he has little or no knowledge of the role of newspapers in general, of journalism or, specifically, the situation of, and the items carried in, the Cape Times. But why he should be so interested in this matter is a question that continues to be asked. Is it because Sactwu, through its investment company, has pumped a few hundred million rand into the Sekunjalo-led consortium that now controls INM? After all Sactwu now owns the Seardel clothing factory where Kriel has promised the 3 000 workers “jobs for life”. However, his intervention — whatever motivates it — is essentially a sideshow. The real issue is the facts at stake as a rag-tag group of critics continues to assault what is, in effect, the straw man of the Cape Times. I don’t think anyone knowledgable — and not least the journalists working on that title — would deny that journalistic standards have slipped over the years. That they were able to be maintained at the present level is an incredible tribute to those who produce the newspaper (as well as other INM titles). Take this simple fact into account: 20 years ago there were roughly 5 000 INM employees. Today the number is roughly 1 500. The company was bought in 1994 by baked beans tycoon, Tony — since 2001 Sir Anthony — O’Reilly, reputed to be Ireland’s first billionaire. He set about syphoning profits off to pay fat dividends and to shore up the losses of his newspapers in England and Ireland. Then began the asset stripping of the once sound Argus company. O’Reilly’s initial investment of R725 million resulted in billions of rands in profits flowing abroad. 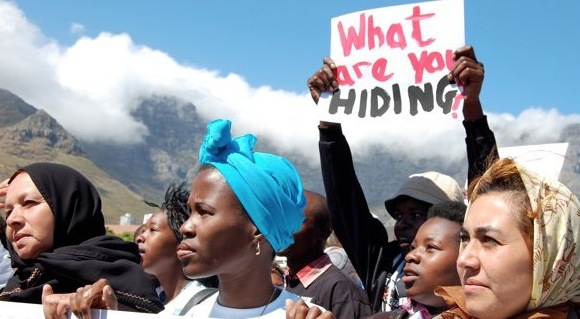 In ten years to 2010, for example, it is estimated that some R4 billion moved offshore. At the same time, there was no investment locally in staffing or machinery and, when worker levels were cut as far as they could go, physical assets were sold off. In what I called at the time an “act of gross vandalism”, the country’s oldest newspaper clippings library was thrown out. The librarians who worked there were also retrenched. Yet O’Reilly continued to press editors to increase profits while failing to provide any investment — and appeals by editors and senior staff were ignored. In 2000, this asset-stripping pirate who had been welcomed by Nelson Rolihlahla Mandela as an investor, was appointed a member of Thabo Mbeki’s International Investment Council. In what now looks like something of a sick joke, this IIC was set up to advise government on how to attract foreign investment. But O’Reilly did not interfere in editorial matters. He was clearly interested only in the money. What this meant was that journalists in particular, had to cope with massively increased workloads and had, increasingly, to rely on trainees and interns while management continued to raise cover prices. Standards fell and, along with them, circulations among an increasingly price-conscious pubic. the Cape Times and Argus and other titles no longer own Newspaper House. It was sold. And these newspapers are no longer printed by the company: that job is now outsourced. Outsourced too is the printing of the biggest metropolitan daily in the country, the Johannesburg Star (and related publications). All of this has very little — if anything — to do with levels of labour or any other coverage or the pigmentation of journalists. When a newspaper has too few skilled staff, it is obvious that there will be greater reliance on those sources that readily provide comment. In such an environment it is little wonder that there are, in South Africa, now more public relations or communication consultants than journalists. The issues of investment, staffing levels and training are what should be addressed, along with that of ownership and, crucially, editorial independence that cannot really exist outside of a properly resourced media where all operations are transparent. 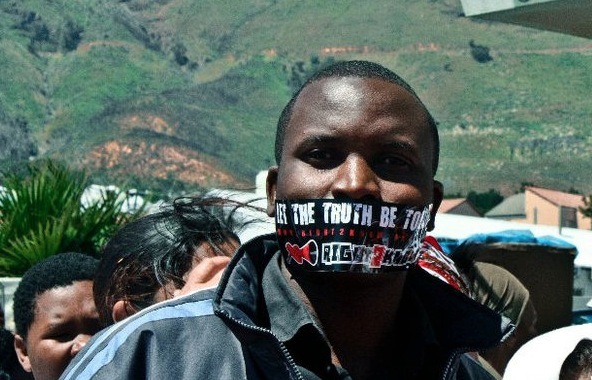 The threat to media freedom in South Africa has never been greater.